St. Martin is an island shared by two countries, the Netherlands and France. Chris Doyle in his excellent guide to the Leeward Islands relates a story that he in no way represents as true. It doesn’t need to be true. It’s a fun story. It seems at the time the French and the Dutch were to settle on the demarcation between the two sides of the island they decided to be civilized about it. "They had a Frenchman armed with a bottle of wine walk along the coast in one direction and a Dutchman equipped with a flask of gin take the other. Where they met became the boundary, and the French ended up with a bit more because the gin was stronger than the wine." Drinking is better than fighting any day. In the early days St. Martin was a producer of salt, tobacco, and sugar but all these industries met their demise and both sides of the island fell into decline. To curtail this decline in 1939 the island was made duty free and this was a spectacular success. It is now one of the busiest tourist destinations in the Caribbean. 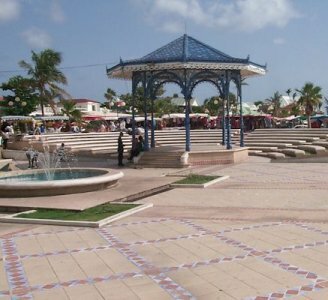 As a result the Dutch side (Sint Maarten) is somewhat bustling and not the type of place anyone goes to "get away from it all." 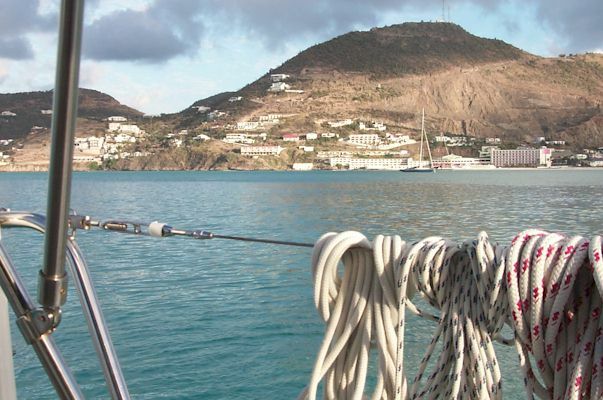 The capital is Phillipsburg and was our choice as the place to end our passage to the Caribbean because of the wealth of services provided to the voyaging yachtsman. We were able to provision, make telephone calls, send e-mail, and purchase needed items of boat hardware. After a week we were ready to sail to a more laid back place so we formulated a plan. We were meeting friends at Orient Bay on the French side of St. Martin during the early part of June and since it was more than two weeks away we had enough time to sail to Anguilla and enjoy life at an easier pace. I don’t want to leave the impression that Dutch Sint Maarten is an unworthy place to visit. Everyone seeks different pleasures when on vacation. With casinos and countless nightspots the Dutch side offers everything for the person seeking a lot of "action." But Linda and I are like most cruising sailors and prefer quieter places.